If you have opted to host your Motorcentral database with Limelight Software your information & all vehicle photos are backed up automatically on a daily basis. However, we highly recommend you also take your own data backups on an occassional basis and store them off-site on a robust portable device. 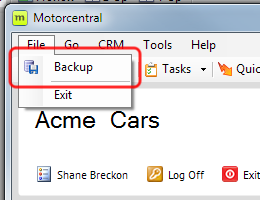 Backing up your Motorcentral data is extremely simple. Begin by navigating to Housekeeping under the Tools menu in the Menu Bar. You will then be presented with the following Backup options. Select whether or not you'd like the backup to include your vehicle information or not. 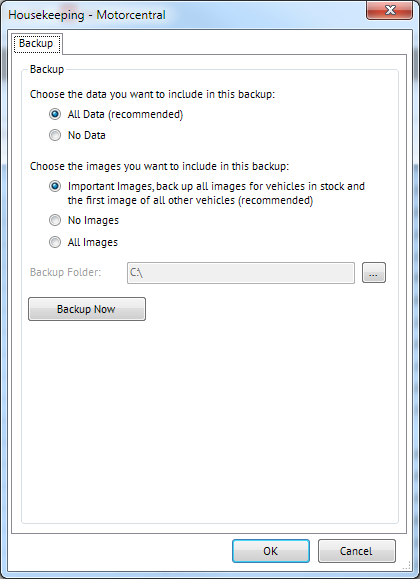 We recommend you always backup your vehicle data at the very least, however if for some reason you only wish to backup your vehicle images, you may do so by selecting No Data. All images: Every vehicle image viewable within the Motorcentral system will be backed up. Requires the most disk space. No images: No vehicle images are backed up. Requires no disk space. Important images: For unsold vehicles, all available images are backed as well as the primary (first) image of all historical vehicles. Still requires some disk space, but much less than All images option. Finally, select the location you'd like the backup file to be saved to. Motorcentral will remember this location for next time automatically. Clicking the Backup Now button will invoke the backup and save a zipped file at the location selected. Motorcentral will automatically name each file based on the date and time it was created. An example being, MC Backup 20110620 153159.zip. Click OK to save your settings and next time you wish to backup you may do so be either returning to the Backup tab under Housekeeping or clicking Backup from the File menu of the main window.